Nandhyala road expansion victims ... are facing serious difficulties. In July 2017, the buildings were demolished to cover the expansion of the road from Gandhi Chowk to Sai Baba Nagar Arch. 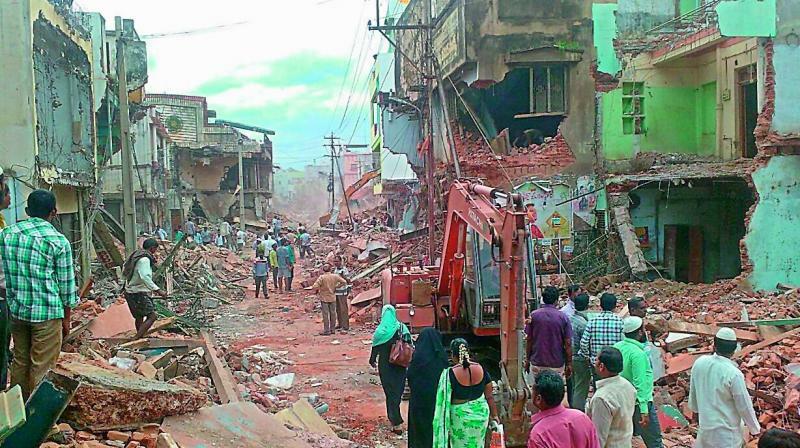 The municipal council officials were demolished in the buildings on either side from Gandhi Chowk to the Padmavathinagar Arch up to 60 feet, from Padmavati Nagar Arch to Sai Baba Nagar up to 80 feet. When the arrangements were made to complete the compensation, the state government set up a new software in the month of March and ordered the victims to submit the new details of the victims. But the victims are worried about changing conditions. There were 166 victims in the 80-foot expansion, and for six months they had been worried for a few days. Recently, the district collector asked him to come together and request the MLA Bhuma Brahmananda Reddy to solve their problem immediately. While payments were delayed, several movements were taken up with the help of the expansion of the highway. Despite the concerns of the victims and the public representatives, the payments have not yet been made. According to the thousands of victims affected room mate at Rs 18, the government agreed to pay compensation. The Chief Minister also said that the victims were concerned about Rs 80 per sq mt of Rs 80 per sq mt of Padmavathi nagar Arch to Sai Baba Nagar, while the victims were also concerned about the issue and the Chief Minister was also willing to pay equal compensation to all of them. There were 405 victims in the expansion of roads. Of these, Rs 60 crore has been allocated from Gandhi Chowk to Padmavatinagar Arch to 236 structures at 7,000 sq ft and Rs.35.35 crores to pay Rs. 25.10 crores to 124.